When it comes to plumbing, electrical, and heating and air conditioning, there will always be at some point in time mechanical failures with equipment and appliances. It is just the nature of machines. Parts wear out with use, things go wrong, and units have to be either repaired or replaced. 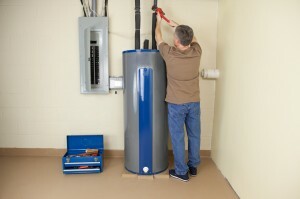 When your water heater ceases to operate, leaks, or is no longer heating the water, it is an indication of a problem that requires water heater repair. For those of you in the Phoenix Arizona area, your water heater repair solution would be to contact Eagle Services Plumbing. For the most part, water heaters are typically reliable appliances but sometimes there may be issues. Here are some of the common indications that something is wrong with the water heater. These are indications of a problem, and in order for that problem to be remedied, additional steps must be taken for water heater repair. There are safety precautions that must be taken, and you can be seriously injured or worse if you don’t heed them. You can avoid any potential hazards if you prefer by contacting a qualified licensed Arizona plumber/electrician such as Eagle Services Plumbing. No Hot Water – this may be a result of a defective gas pilot control valve or thermocouple, an electric thermostat that has gone faulty, or a defective electric heating element. Possible remedies would be replacement of any defective parts. Limited Amount of Hot Water – the water heater may not be large enough for the demands being placed on it. There could be a damaged dip tube that might need replacing, or possibly the plumbing has the hot and cold water “crossed.” Another possible reason could be a defective heating element. Rusty Colored Water – this is an indication of interior lining corrosion. Corrosion could mean replacement instead of water heater repair, and a qualified plumber is probably your best source of advice in this instance. Rotten Egg Smelling Water – this is usually due to bacteria caused by anode decay. This may require flushing out of the water heater and anode replacement. If this fails to remedy the problem, a plastic lined tank may be in order. Popping or Rumbling Noises – this can be the result of sediment buildup in the tank which causes water to overheat and boil, which creates the noises. This is usually resolved by flushing out the tank. Leaking Water Heater – this might be caused by a corroded and leaking tank, a defective T&P valve, or a leaky plumbing connection. Possible solutions include valve replacement, or possibly water heater replacement if the problem is with tank corrosion. It is easy to see it can take some time to troubleshoot water heater problems, and your best course of action may be just to let an experienced and knowledgeable plumber/electrician pinpoint the problem for you. If you are experiencing problems with your water heater, Eagle Services has a qualified licensed service team to diagnose the cause and get your water heater back up and running properly. Call them anytime day or night for all of your electrical, plumbing, and HVAC needs in Phoenix and the surrounding area. I never realized how dangerous it was to replace a water heater until I saw one explode, or I should say I saw the aftermath. I remember back in the day when anyone could go down to the hardware store and get a replacement water heater and install it yourself now days that is against the law right you have to be a licensed plumber? Lucky for me, I live in a tropical climate where it is humid and muggy all year round. So I actually hardly ever done the hot water heater on. The cold showers serve me well the locally my body temperature during these hot days of summer and fall and winter. And the money / electric savings are great. Some overly I won’t have any repairs any time soon. This has been very interesting and there is no way that I would try to repair a hot water heater, they are almost always gas units and I am afraid to mess around with gas. I have seen the aftermath of a water heater that blew up and I would not want to be to blame for that. Thank you for the information on the plumber though that will be very helpful. I like to give the water shut-off valve a twist to keep it from seizing. If it is a gas water heater, set the gas valve to “Pilot” to prevent the burners from coming on throughout the flushing process. If electric, turn off the circuit breakers. I drain the sediment from the tank by attaching one end of a garden hose to the drain valve at the bottom of the unit. Even if you’re not ready to replace your water heater with a new energy efficient model, I’ve come to learn that you can still do things to save water and cost. Whether it’s a natural gas, propane, oil, electric, tankless and solar model. They all vary in terms of first cost and operating costs. Tankless models provide on-demand hot water but cost 2 to 3 times as much as a standard gas model water heater. A water heater service man told me that the SAME gallon capacity heater can heat water at different rates. This is a well-kept secret many people are unaware of. The burner at the base of the heater comes in different sizes. He also said, the bigger the burner, the faster it can heat water. Often the burner size is related to the warranty. I believe this is a decision the stocking distributor makes. Thank you for posting the indicators for a hot water tank going out, I had never known what to look for and this will help a great deal in determining that and could save me having to pay for a lot of damage repair when It does go out. Is it true that you can’t legally fix these yourself anymore? There is nothing worse than discovering those long, hot showers you are used to taking aren’t so hot anymore. Maybe your hot water heater has sprung a leak or it’s just stopped working. Well, it might be time for you to replace your water heater. The average life span of a water heater is between 8 and 12 years. When it comes time to replace yours, chances are, you’ll pick the same type of unit. This was very informative and it will be very helpful in the future, we just moved into the house we are living in and the water heater was replaced before we moved in but this will help us to keep an eye on it and know when things are going bad again. Do they go bad faster if you have hard water? And can they really blow up and cause a fire? Yes, the hard water here in the Phoenix area can reduce the life span of a water heater. Most of the time a water heater goes bad, you’ll know it by the water flooding out of the garage. In rare cases where a water heater was not properly installed, a fire can start or an explosion can happen. That’s why it’s important to use a professional Phoenix electrician and plumber like Eagle Services. I read that the U.S. Department of Energy estimates that 12 percent of the average home utility bill comes from heating water. Only heating and cooling the home itself are more energy-intensive. Shoppers in the market for an efficient water heater can start by looking for an Energy Star label, bestowed by the U.S. Department of Energy) and the Environmental Protection Agency to designate energy-efficient products. Other choices depend on your d pocketbook. The savings from using an energy efficient water heater can nearly pay for the unit over the course of several years. Thank you for posting this I was hearing that knocking sound that you were talking about as a sign that something is wrong but I just figured it was no big deal, after reading this article I decided to call a repair man and he told me that if I’d waited much longer it would’ve been to late for repair and it would have been a replacement instead and cost me a lot more money. While a water heater is probably the most costly component in your home’s plumbing system, most problems with it are usually fairly easy to figure out and fix. Some of the common water heater problems you can run into and fix are – not enough hot water, water that’s too hot or too cold, smelly water (rotten eggs smell) or the tank is making noises. The worst water heater problem is a leaking tank. Yep. A leaking water heater is a sure sign it’s time for a new one. Call us for specials. I was told by a repair man that the heating of water in your water heater causes calcium carbonate to precipitate out and settle to the bottom of the tank. Also contributing to sediment buildup are any particulates that may be in your water supply like sand. Sediment is usually more of a problem in areas with very hard water. Is this a common problem with water heaters? It sure is Jamison. We have really hard water out here in Arizona and it takes its toll on your pipes, faucets and fixtures and even your water heater. We perform a full diagnostic maintenance on water heaters. Give us a call if we can help.